Get yourself some self-care, stat! When this Tarot Queen appears ill-dignified, there’s an element of burnout that needs to be addressed urgently. Have you been running on empty, trying to please everyone and take care of everything? Time to re-establish some balance of give and take here. If you’ve been the taker in this situation, show some appreciation for the givers in your life and do something to address the imbalance before Karma steps in (and you know She will). 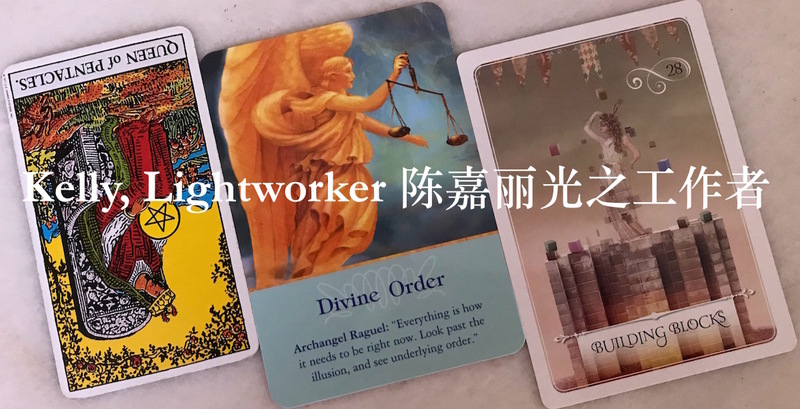 So take care of yourself, and be careful with those around you – this card could signify a situation or literal person in your life who could play a role in what happens in November. The names of the Angels and Archangels often reveal their unique Divine roles and functions. The name Raguel means Friend of God. Raguel is the Archangel of justice and harmony. He’s an Archangel Who doesn’t speak much, but when He does, the Universe sits up and listens. Raguel works best with people who desire to establish fairness and peace in relationships, and who are willing to take the initiative and make things happen. So look around you: is there some reversed Queen of Pentacles energy stirring trouble around you? Is a dysfunctional dynamic, person, or situation in your life creating imbalance and injustice? Guess what, chickadees: according to Raguel, it is meant to be. It’s meant to be so that you can take action to redress the imbalance, resolve the injustice, and restore Divine order. So step forward bravely and do what needs to be done – not in a spirit of vengeance or fear, but with the wisdom and courage of compassion. And the blessing of Heaven goes with you. This is a wonderful card to round out the reading! When Building Blocks appears, this month is a great time to look to your foundations and make them strong. As you grow surer and more confident in who you are and what you stand for, you will attract all the happiness, abundance, love, and blessing you desire and deserve. There’s a Bible verse that says Do not despise the day of small beginnings. It’s very true – we all look forward to big plans in the future, but here and now is what we have. All the more we need to cherish our time spent working on the fundamentals – once our destinies manifest (and they will), there will be so much joy. Do bear in mind that the Venus retrograde ends on 16 November but the final Mercury retrograde of 2018 starts the next day, on 17 November! With two major retrogrades back to back, it makes perfect sense that the Oracle advises us to review our bases, repair our nets, and be present for the blessings of here and now. Have a great November 2018!